Principal says safety a top priority, but "What else are we going to do?" (CNN) -- Bright yellow buses have long represented reliable daily journeys between home and the classroom, but schools are increasingly parking the durable icons and unintentionally compromising community coffers and student safety in the process. Buses account for a quarter of school transportation, but only about 2 percent of fatalities, a report says. When budgets plummet, experts say, administrators look to cut costs. Busing is easy to ax because its connection to the classroom is indirect. "We've seen it for the past year or two," said Robin Leeds, industry specialist for the National School Transportation Association. "If it comes down to cutting teachers or cutting buses, they're always going to cut buses." School districts all over the nation -- from San Diego County, California, to Walden, New York, to Collier County, Florida, and myriad locales in between -- have slashed or proposed slashing some bus services in recent months, according to media reports. Principal Carol Moehring at North Royalton High School in suburban Cleveland, Ohio, had her daily routine upended last week when the school district cut bus service to the high school. Other cost-cutting measures included eliminating 17 nonteaching positions, charging fees for spring sports and freezing pay for teachers and administrators. "We tried to start as far away from the classroom as possible," the principal said of the cuts. Moehring used to arrive at about 6:45 a.m.; now she gets to school about 6 to supervise early arrivals. By 6:25 a.m. on Monday, she was in the cafeteria, where she and four teachers supervised about 450 students as they chatted, munched on bagels and checked their phone messages for half an hour before heading to their lockers and then their 7:20 classes. Of North Royalton High's 1,700 students, about 1,000 are now being dropped off and about 400 drive themselves, the principal said. The remaining students walk or bike when the snow allows, or they catch rides with friends. Kathy Dapsis is now picking up her son, Dylan, 15, who used to ride the bus, and said she feels sorry for the scores of students walking home because many streets don't have sidewalks, leaving them to traverse the shoulder or roadway. It also troubles her that they're walking in heavy traffic and freezing temperatures. "They're coming to school soaking wet. They say wear boots, but high school kids aren't going to wear these big, chunky boots to school," she said. School officials say they're aware that walking and riding in cars present dangers not inherent to a school bus, and they took weeks preparing parents and students for the transition. On the positive side, Moehring said, attendance has never been better and "they get here on time." Moehring is not the only person inconvenienced by the budget crunch. Other administrators, including the school superintendent, have helped direct traffic; teachers' nine-hour days are closer to 10, not counting extracurricular activities; and many parents have to get up earlier or arrange car pools. Susan Kasaris' husband and neighbor take turns driving their kids about four miles to school. Next month, Kasaris will chip in, getting up 30 minutes early to drive her 15-year-old daughter and the neighbors' children to school. Kasaris also needs to make sure her three younger children get on the buses to elementary and middle schools, she said. Had the Kasarises not been able to arrange a car pool, "I wouldn't be very happy," she said. Moehring worries that, beyond inconvenience, the cuts may affect learning and teaching, she said. The staff and students are already getting tired, and the new routine is only in its second week. "It's certainly been a burden on the kids," she said. "That extra half-hour of sleep [that they're losing] is good for them. I think they'll be anxious to see busing come back." The bus cuts also have increased police workload, even after weeks working with the community to prepare, said Detective Dave Loeding of the North Royalton Police Department. In addition to helping direct traffic outside the school on dark mornings and bustling afternoons, two police officers have to man the nearby intersection of two major thoroughfares in the town of about 30,000. "Even if they're not on [overtime], they're taken away from otherwise normal duties," Loeding said. "Each time I see the officers, they say, 'Well, we got through another day.' "
Though the first week went relatively well, there were hitches, he said, namely a fender bender and an "overanxious kid" who pulled out of the school and collided with the car of a grandparent arriving to pick up a student. More danger on the roads is just one cost of cutting buses, said Mac Dashney, a consultant with the Pupil Transportation Operation and Management Institute. Standard buses carry between 65 and 77 passengers, he said, so for every bus you take off the road, you're adding 30 to 40 cars, meaning more fuel consumption, pollution and wear on the infrastructure. Plus, Dashney said, the average car weighs 3,500 pounds, about a 10th of what a bus weighs -- so "just the sheer size of the bus -- passenger size, physical size -- makes the bus safer." 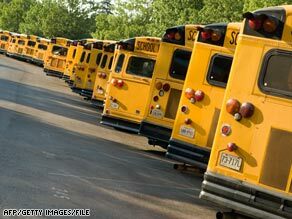 A 2007 congressional report outlined the risks of taking children off school buses. Citing the Transportation Research Board, the report said about 12.5 million students -- roughly a quarter of the nation's K-12 students -- took about 5.5 billion school bus trips between 1995 and 2005. On those trips, there were 1,368 fatal crashes, only 97 of which killed a bus driver or passenger, the report said. "If we talk about the cost of lives, we want to put these kids on school buses," said Dashney, who has 40 years of experience in traffic safety and student transportation. There are other ways to save money on transportation without cutting bus services, he said. School districts can save money by privatizing bus service, but they may lose flexibility. Other options include renegotiating personnel contracts or consolidating buying power and repair costs across school districts. Rather than 10 districts buying two buses each, it's cheaper for them to buy 20 at once, he said. Also, in states that allow it -- such as California and Massachusetts -- school districts are charging parents between $50 and $200 a year for bus service. Dashney concedes politics and bureaucracy are at play in such decisions, and special consideration must be given to school employees, who oftentimes are residents, voters and parents as well. In North Royalton, voters will hit the polls May 5 to decide whether to hike homeowners' taxes to raise millions for the school system, which could provide funds to restore bus services. However, the community has twice voted down the measure, which would cost the owner of a $100,000 home another $181 a year. School Superintendent Randy Boroff said residents are facing tough economic times and have minimal say in the rising costs of food, gas and taxes. "It's just difficult economic times for everybody, and unfortunately this is the one opportunity they have to say no," he said. Student safety is a high priority, Boroff said, but the primary objective is "to protect the academic program." "Safety is always first and foremost. However, you have to pay the bills," added Moehring, the principal. "What else are we going to do?"